DATELINE: Ben-Hur Takes on The Rifleman? In 1973 came a prophetic movie about greenhouse gas and environmental calamity in the ruse of a murder mystery. Its cast stuns: Charlton Heston, Edward G. Robinson, Joseph Cotten, Chuck Connors, and a raft of familiar second bananas like Cyril Develanti and Whit Bissell. Apart from the all-too-soon prediction, suggesting the calamity arose by 2022, the film is prescient. We think it may be the world of New York in 2073 when crowds teem the streets and heat and lack of supply dominate the lifestyle. Only the rich have soap and beef. When Heston the cop goes investigating, he is awestruck by the luxury. His roommate (perhaps college professor mentor of years past) is Edward G. Robinson in his final acting role. Chuck Connors has a wig also as outrageous as that on Heston. You keep wondering why it never fell off during those crowd scenes. From its opening montage of fossil fuel guzzlers and growing population, the film has several bravura sequences. Reminiscent of Nazi liquidation and final solution, there is a “home” base where people go to die. Cue up the Tchaikovsky symphony “Pathetique,” used also in Howard Hughes’ movie called The Outlaw. It remains a highly prized movie by aficionados of the genre, making it the second act of sci-fi flicks for Heston after his epic heroes like Moses and Ben-Hur. This one is less known than Planet of the Apes. You don’t have to be clairvoyant to figure out the problem with soylent green, the new foodstuff. And, it all seems quaint in the age before computerization. An early computer game is played in 1973, a half-dozen years before the craze caught on. Twenty years after the amazing Gilda, Glenn Ford and Rita Hayworth co-starred again in a small-budget film noir. This time it did not have the wit or undercurrent of the closet classic of 1945. Ripe middle-age makes the pairing interesting for older film fans, but lost youth often is overrated. By 1965 Ford and Hayworth had faces and the best lines were in their faces. The film is old-fashioned with dissipated cops, aging ingenues, and deep dollops of cynicism. True noir was already past its prime when The Money Trap flopped at the box office, despite having costars like Ricardo Montalban, Elke Sommer, and Joseph Cotten. The cast is marvelous, hard-bitten, and gives last hurrah performances. Baby Boomer audiences of the day fell down on the job of paying tribute to the formerly great stars. In the film Ford and Montalban turn out to be corrupt cops needing big bucks, and Ford couldn’t handle his new generation rich wife, Elke Sommer. Instead, he found his old flame, floozie Rita, worth a second look. Yep, they had that old bugaboo, oft called ‘chemistry’. Cotten plays a mob doctor with oodles of money hidden in his luxurious home—and the two cops need to steal it to maintain a lifestyle way beyond police salary. Montalban becomes too greedy—and therein lies a double-cross emeritus. What a wonderful throwback, better appreciated today than when it was originally made with more gloss than grime in the production, but the tone is pure 1940s crime melodrama. Certain plays will never make it to film because the demographics are not right. It takes an act of superstars to pull it off. Cable networks do yeoman work in bringing rare works to the screen, but in 1973 before anyone thought of cable, movies were still the purview of audiences that loved their grand stars. 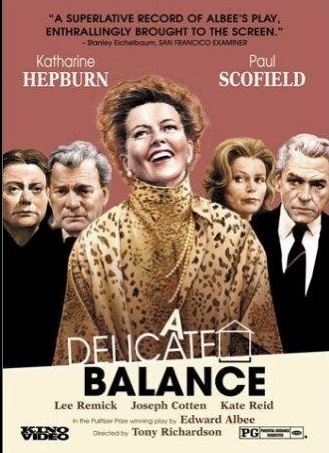 One of the era’s lost masterpieces included the prestigious absurdist drama A Delicate Balance by Edward Albee. With its ponderous and literary dialogue, it might win a Pulitzer Prize, but it would lose the wider audience of film fans unless you made it a star-studded spectacle. And so, Katharine Hepburn and Paul Scofield signed on as the well-to-do, educated couple Agnes and Tobias. Their multi-divorcee daughter could be played by Lee Remick. Their best friends, equally educated and rich, were Joseph Cotten and Betsy Blair. Throw in Kate Reid as the alcoholic sister of Hepburn, and you had an intriguing cast. And a plot that never pays off. Alas, only Reid seemed to know how to handle the surreal dialogue with a deft touch. The others were all doing soap opera on afternoon network TV. Yet, you must not miss it, even if you have to hang on to your No-Doze. This play was written in an era when literate playgoers could follow densely packed metaphors. It seems long-time friends Harry and Edna (Cotten & Blair) show up suddenly on the doorstep of Hepburn and Scofield in a state of panic, terror, and fear. Of what we might ask? Old age? Loneliness? Or some other devil? Perhaps it does not matter as the absurdist interplay involves consideration of the depth of friendship. To have your oldest, old friends decide to move into your home may be a bit much even for those who can afford it. Though there are red herrings to indicate violence is around the corner and under the surface (murdering cats, mass killing of one’s family, and a loose gun in the hands of a hysterical woman), there really is no payoff that way. Today, we’d be expecting a bloodbath. But, this is 1973 when theatre was not quite dead and not quite physical. That’s the delicate balance apparently. After Niagara, Where Do You Go? Joseph Cotten and Jean Peters had a great hit in 1953 with Niagara, but no one recalls their follow up movie. It was called A Blueprint for Murder—but done without costar Marilyn Monroe. Whenever you find another lost film noir from the 1950s, you may have either a treasure or something unworthy of rediscovery. The pleasure is in finding the movie the Late Show never played endlessly in the days when movies were fodder and filler on television. You will always find a prize in the Crackerjack box. This one may surprise you. By the time of this movie American society began to realize that the most innocent of creatures could be a psychopath. Hence, this movie played on the novelty. In this case Hitchcock’s Uncle Charley from Shadow of a Doubt renews his vow, thanks to Cotten’s performance. This 1953 effort is written and directed by Andrew Stone with “you are there” in upper middle class America style. It catalogues a lifestyle of indolent post-war innocence in American suburbs. 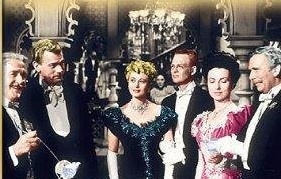 The film features Joseph Cotten, Jean Peters, and Gary Merrill. Jean Peters always played good girls with a gold heart. She was also Mrs. Howard Hughes, and her movie career was now in decline. She probably decided to shake things up by playing a sociopathic serial killer. She made only three or four additional movies before retiring from the big screen. She could have stopped here and knocked’em dead with strychnine. Yet, this movie mind-twister may actually have another suspect duping the audience along the way. Short and sweet, this little film might have been a television special in the Golden Age. It is amusing and clever with its red herrings. Too bad few people ever saw it in its original release. There is some satisfaction in being one of a handful that has seen the delightful murder mystery. Now available because of the voracious appetite for more and more entertainment by DVD watchers, this movie becomes a gemstone for those looking for Hitchcock Zirconia. What the film proves is that steady and professional actors like Gary Merrill and Joe Cotten deserved far more accolades than they ever received in their lifetimes. A trifle, the movie is indeed a blueprint for delight for film aficionados. ‘Who done it’ achieves a minor classic status with this one. Be sure to read William Russo’s movie books: MOVIE MASHUP, GREAT SPORTS STORIES: THE LEGENDARY FILMS, ALFRED HITCHCOCK FRESHLY SHOWERED, and MOVIES TO SEE!